Odo Hirsch’s Darius Bell and the Glitter Pool (2009) tells the story of the Bells, a proud family fallen on hard times; plucky youngest son Darius must save the family’s estate. (Name nerd bonus info: Odo is the older form of the German name Otto). Darius is the Latin form of Dareios, the Greek form of the Persian name Dārayavahush, meaning “holding on to goodness”. This name was traditional amongst the Persian kings, and Darius I was known as Darius the Great, as he ruled over the Achaemenid Empire at the height of its power. Darius III was defeated by Alexander the Great, and there are a number of minor princes with the name. Darius is mentioned several times in the Old Testament, so it is a Biblical name as well (nobody is sure which historical Darius it means). Although rare, this name is known in Australia from NRL star Darius Boyd, while there is also a Darius in The Hunger Games trilogy. Darius is a cool-sounding name that might appeal to a broad range of people. Terry Denton’s first picture book was Felix and Alexander (1985), about a little boy named Alexander who gets lost, and his toy dog Felix must find him. Felix is a Latin name meaning “fortunate”. It was first given as a nickname to the Roman general and statesman Lucius Cornelius Sulla, a free translation of the Greek nickname he acquired during his military campaigns – Epaphroditos, meaning “beloved of Aphrodite”. The Roman procurator Felix is mentioned in the New Testament, although not in a positive way – he imprisoned St Paul. Felix was a favourite name amongst early Christians, and there are heaps of saints named Felix, including the 7th century Felix of Burgundy, who introduced Christianity to East Anglia, and three popes. Two Australian connections are Felix the Cat, and Australia Felix, the name given to the lush farmland of western Victoria by explorer Sir Thomas Mitchell. Felix was #172 in the 1900s, and left the charts in the 1920s. It returned in the 1980s at #396 and climbed steadily; it’s been on and off the Top 100 since 2011. It’s now #86, and was one of the fastest-rising names last year. A hip retro favourite growing in recognition. Sleepy Harley (2011), written by Karen Treanor and illustrated by Kelly Iveson, is a picture book about a cat named Harley who tries to find a place to nap in a Perth suburb. Harley is a surname which comes from a place name meaning “hare meadow” in Old English. The de Harley family were nobles whose history can be traced before the Conquest, and Sir Robert Harley, first Earl of Oxford, was from a prominent political family. One of them, William Cavendish-Bentinck, became British Prime Minister in the 18th and 19th centuries; he was the maternal great-great-great grandfather of Queen Elizabeth. The name will remind many of Harley-Davidson motorycles, giving Harley a pretty cool image. Harley was #212 in the 1900s, and went up and down before dropping off the charts in the 1950s. It returned in the 1970s at #462, and rose before peaking at #70 in 1992. It dropped again before starting to rise in the early 2000s, and is not far out of the Top 100. You could see Harley as an underused classic – in use for many years, but never very popular. I have occasionally seen Harley on girls as well. Me and Jeshua (1984) by award-winning author Eleanor Spence is a historical novel about the childhood of Jesus of Nazareth, as seen through the eyes of his cousin Jude. Jude is a variant of the name Judas, Greek form of the Hebrew name Judah, meaning “praised”. In the New Testament, Jude is used for the Apostle whose name was Judas, to distinguish him from Judas Iscariot. Jude is also listed in the New Testament as one of the brothers of Jesus (Eleanor Spence follows a tradition they were cousins), but it is not clear if Jude the Apostle was Jesus’ brother. The Apostle Jude is usually connected with the Apostle Simon the Zealot, and according to tradition they were both martyred in Beirut. Jude is well known as the patron saint of lost causes, and this has made him one of the most venerated saints. Contemporary associations are the actor Jude Law, and the Beatles song Hey Jude. Jude can also be used as a girl’s name, short for Judith, as in the YA novel by Maureen McCarthy, Queen Kat, Carmel, and St. Jude Get a Life (1995). This attractive name has quietly been gaining in popularity, and last year joined the Top 100 in Victoria. 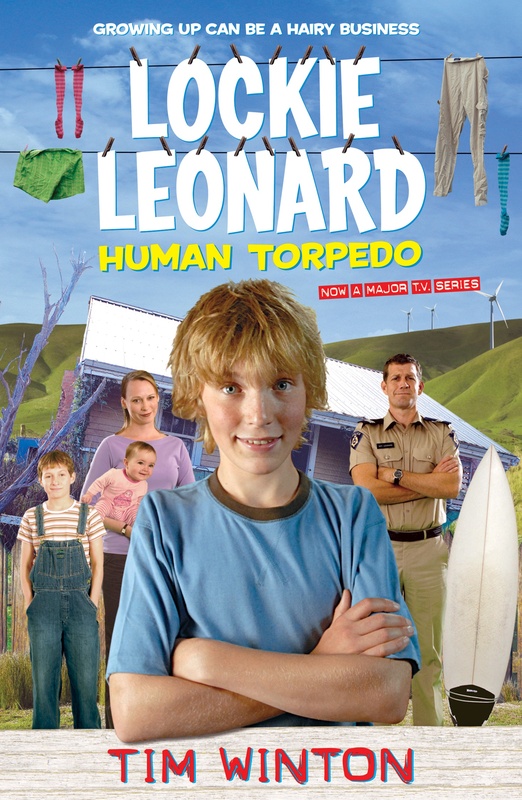 The Lockie Leonard series by Tim Winton (1990-97) stars a surf rat named Lachlan “Lockie” Leonard who moves to the Western Australian town of Angelus (based on Albany). Leonard is a Germanic name which can be translated as “brave lion” or “brave as a lion”. St Leonard is a legendary 6th century saint, a Frankish nobleman at the court of Clovis I who could liberate prisoners from their chains when invoked. The Normans brought the name to England, although it didn’t become particularly common until the 19th century. Famous Australians with the name include distinguished chemist Leonard Lindoy, and hard-hitting post-war cricketer Leonard “Jock” Livingston, also a talented rugby league footballer. Leonard has been a popular name amongst Jews in the past, including Jock Livingston: other examples are Canadian folk singer Leonard Cohen and actor Leonard Nimoy. Leonard was #39 in the 1900s, and peaked in the 1910s at #35. It didn’t leave the Top 100 until the 1960s, and remained in steady but low use until getting a little boost after The Big Bang Theory, with main character Leonard Hofstadter, began airing in the late 2000s. Clunky cool, this underused classic provides a way to get the popular nickname Lenny. In Isobelle Carmody’s YA novel The Gathering (1993), Nathaniel Delaney is a teenager who moves to a grim seaside town and finds himself locked in a battle between the forces of Light and Dark. Nathaniel is a variant of Nathanael, the Greek form of Hebrew Netan’el, meaning “God has given”, nearly always understood as “gift of God”. In the Bible, Nathaniel is usually identified with the Apostle Bartholomew; as Bartholomew means “son of Talmai”, it is taken to be Nathaniel’s surname. Nathaniel was in use as an English name by the 16th century, and became more common after the Protestant Reformation. It was used amongst the aristocracy, and also became a favourite in America, with author Nathaniel Hawthorne a notable bearer. Nathaniel was #179 in the 1900s, and left the charts the following decade. It returned in the 1970s at #296, and climbed steadily until it reached the Top 100 last year at #79, making it one of the fastest-rising names of 2013. A handsome retro name that gives the popular nickname Nate, it’s well known from Australian actor Nathaniel Buzolic, from The Vampire Diaries, and Australian singer-songwriter Nathaniel Willemse, who was on The X-Factor. The Rafferty series by Joan Woodberry (1959-62) are the adventures of an English boy named Rafferty who moves to a fishing village on the Queensland coast. Rafferty is a common Irish surname, an Anglicised form of O’Raithbheartaigh, meaning “son of Rabhartach”. The Old Gaelic personal name Rabhartach means “wielder of prosperity”. The name has a particular Australian resonance, due to iconic Australian actor John “Chips” Rafferty. He was seen as the quintessential Australian, and took part in a marketing campaign convincing British people to migrate to Australia in the 1950s – this might explain the choice of Rafferty’s name in Woodberry’s books. Another Australian reference is the slang term Rafferty’s rules, meaning “no rules at all”. It gives the name Rafferty a pleasantly raffish, lawless feel. This name is around the 200s in Australia, and although it is rising in the UK, is more popular here than anywher else. I have also begun to see a few girls named Rafferty. The Rowan of Rin fantasy series by Emily Rodda (1993-2003) takes place in a fictional world. Rowan is the unlikely hero, considered a bit of a wimpy weakling by the sturdy villagers of Rin, but when danger strikes, his resourcefulness and courage saves the day. Rowan is a Scottish name that’s an Anglicised form of Ruadhán, a pet form of Ruadh, Gaelic for “red”, often given as a nickname to a man with red hair. You may remember that the red-headed Scottish outlaw Raibeart “Ruadh” MacGregor is known as Rob Roy by the English. Rowan can also be unisex when named after the rowan tree; its English name comes from the Germanic for “to redden”, because of the tree’s red berries, so either way the meaning has a connection with the colour. A pleasant association with the tree is that according to folklore it has the power to ward off evil. The name Rowan has charted for boys since the 1940s, debuting at #205, and climbing until it peaked in the 1980s at #164. It’s now around the 300s-400s. Rowan is an underused modern classic which alludes to a vibrant colour, and a magical tree. Norman Lindsay is famous for writing and illustrating The Magic Pudding (1918), a comic fantasy deservedly recognised as a classic. For some reason, his other children’s book, The Flyaway Highway (1936), is neglected, even though it’s just as funny and fantastical. I loved this story, which relates how Egbert and Muriel Jane meet a “bloke with horns and cows’ hooves” named Silvander Dan, who take them on a journey down the Flyaway Highway. As a child, I thought that the name Silvander was made up for the book (although I’m afraid I was already junior name nerd enough to know what it meant). However, I’ve since found that Silvander was a literary name in the 18th century, and in most of the sources I’ve read, characters named Silvander are untrustworthy bounders! The name is derived from Silvanus, the Roman god of woods and fields, from the Latin silva, meaning “wood, forest”. Although an extremely rare name, it is just enough like Silas and Alexander to not be completely outrageous, and has an agreeably silvery sound. For those who like Leander and Evander, here is another to consider. I told myself I would not choose more than one book from a single author, but was forced to make an exception for Odo Hirsch, from whose oeuvre I could happily fill two lists. Antonio S and the Mystery of Theodore Guzman (1997) is his first novel, a charming story about a boy who lives in a grand old house, and is fascinated by a reclusive actor. (Name nerd bonus info: Odo Hirsch is the pen name of Dr David Kausman). Theodore is from the Greek name Theodorus, meaning “God’s gift”. Theodorus wasn’t uncommon in ancient times; ironically one of its famous bearers was the 4th century BC philosopher Theodorus the Atheist. Because of its meaning, the name was a popular choice for early Christians, and saints named Theodore are numerous, including a 7th century Archbishop of Canterbury and two popes. Theodore was also traditional mongst the Byzantine Emperors, and the Russian Tsars. Theodore was #116 in the 1900s, and reached its lowest point in the 1970s at #383. It began rising steeply in the 1990s, and last year joined the Queensland Top 100 at #79, making it one of the state’s highest-rising names. A sophisticated classic name which comes with cool short forms Theo and Ted, I’d call this underused except I’m not sure how long it will stay that way. The public’s favourite names were Theodore, Jude and Felix, and their least favourite were Leonard, Darius and Harley. Oh I like the idea of using it as an honour name. I’m not sure if I like it either, probably because it’s so uncommon that it doesn’t have much frame of reference. I do like Sylvia though, and this is pretty much a male version. I love the name Sylvia, it was my first choice for my daughter but my partner didn’t like it. I know a young boy called Sylvan, which I also love. Must be related to Sylvia/Sylvander, but personally, I think Sylvan is more ‘usable’ than Sylvander. I love the name Sylvia too, and my husband likewise nixed it (along with any other name starting with S). I agree – I think Sylvan is more usable than Silvander, and it’s very handsome. It’s quite poetic.